Interstate 690 forms a through pass route and urban loop south from the New York Thruway to Lakeland, the New York State Fairgrounds, Solvay and the city of Syracuse. The freeway continues northwest from I-90 as New York 690 to bypass the village of Baldwinsville, while the east end serves commuter traffic in the town of Dewitt. Interstate 690 west at the temporary at-grade intersection for the State Fairgrounds north of Solvay. The access road for the fair grounds Orange Lot ties into the freeway within the three wye interchange for New York 695. Photo taken 01/17/17. 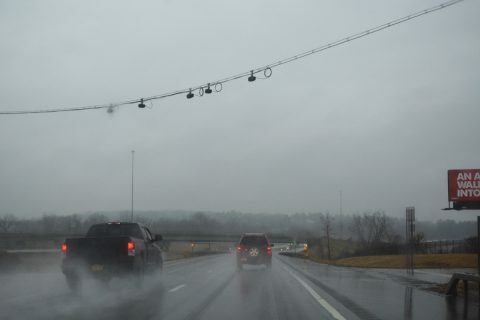 The state is prohibited from limiting or altering the rights of the New York State Thruway Authority to set tolls and fees that are deemed necessary to operate and maintain the Thruway system. Passage of this bill would also serve as a catalyst for other jurisdictions to seek similar toll reductions, thus resulting in further and more expansive toll revenue loss. Spanning Bridge Street with four lanes, Interstate 690 sees a lane drop ahead of the separation of traffic for Interstate 481 north to the NY Thruway and south through eastern reaches of Dewitt. Photo taken 05/09/05. Forthcoming Interstate 481 provides a bypass route for through traffic heading north on I-81 to Watertown and south to Cortland and Binghamton. The bypass may become part of I-81 should the option to remove the freeway viaduct east of Downtown move forward. Photo taken 05/09/05. A left-hand ramp leaves Interstate 690 east for I-481 north. The northeast quadrant of I-481 is somewhat rural, turning west by Cicero Swamp Wildlife Management Area to meet Interstate 81 at the village of East Syracuse. Photo taken 05/09/05. A end shield appears for Interstate 690 eastbound along the southbound ramp to I-481. An unused ramp east to Butternut Drive diverges from this connection just ahead. Photo taken 05/09/05. Interstate 481 travels one mile south from a full cloverleaf interchange (Exit 5) with Kirkville Road through the East Syracuse village limits to Interstate 690 west at Dewitt. Photo taken 05/09/05. A pair of viaducts for I-481 span wetland areas of Butternut Creek, East Ellis Street and CSX Railroad’s DeWitt Yard ahead of the directional T interchange (Exit 4) with Interstate 680 west. Photo taken 05/09/05. Interstate 481 south spans NY 290 (Manlius Center Road) by an array of business and industrial parks just ahead of the ramp departure (Exit 4) for Interstate 690 west. Photo taken 05/09/05. Interstate 690 begins and heads west through East Syracuse to Interstate 81 at Downtown. The urban loop continues northwest to Solvay and the New York State Fairgrounds along Onondaga Lake. Photo taken 05/09/05. Interstate 481 curves northeast from a cloverleaf interchange with NY 5 and NY 92 to meet the east end of Interstate 690. Photo taken by Douglas Kerr (04/01). A left-hand ramp with two lanes (Exit 4) departs from I-481 north for I-690 west to East Syracuse, Syracuse and Solvay. Photo taken by Douglas Kerr (09/25/02). Crossing over the New York Thruway (I-90), Interstate 690 westbound reaches the off-ramp (Exit 3) for New York 48 (State Fair Boulevard) at Farrell Road. New York 48 follows State Fair Boulevard northwest from Farrell Road to Baldwinsville. Photo taken 01/17/17. Back to back off-ramps depart from Interstate 690 west for Jones Road (Exit 2) and the New York Thruway (Exit 1). Jones Road stems south from NY 48 to become Brickyard Road west of Exit 2, parallel to I-90 to NY 173. Photo taken 01/17/17. Ramps at the parclo interchange (Exit 2) with Jones Road tie into the adjacent trumpet interchange (Exit 1) with the Thruway access road. Photo taken 01/17/17. Traffic for Interstate 90 (NY Thruway) departs from I-690 west to Albany, Buffalo, Rochester and Utica. The New York 690 freeway continues another 6.9 miles around the village of Baldwinsville to New York 48 (Oswego Road). Photo taken 01/17/17. An end shield for I-690 accompanies the first confirming marker for NY 690 north at the loop ramp from the New York Thruway. I-390, I-481, I-590 and I-890 also transition into state route freeways at their respective end points. Photo taken by Douglas Kerr (09/00). New York 690 southbound one mile out from the trumpet interchange (Exit 1) with Interstate 90 (New York Thruway). The east-west portion of the New York Thruway mainline always uses the control cities of Albany and Buffalo. The turnpike also serves Rochester and Utica in Upstate New York. Photo taken 05/09/05. New York 690 south reaches the off-ramp (Exit 1) for the NY Thruway access road. Interstate 90 sees six interchanges for the Syracuse area. Commuters using the Thruway may be able to use it toll free if a June 2017 bill passed by the New York State Assembly is signed by Governor Cuomo. Photo taken 05/09/05. The first eastbound Interstate 690 shield stands along side an end sign for NY 690 as the freeway enters a parclo interchange (Exit 2) with Jones Road. Jones Road links I-690 east with NY 48 (State Fair Boulevard). Photo taken 05/09/05. Interstate 90 (New York Thruway) west passes under Interstate 690, one mile ahead of the trumpet interchange (Exit 39) linking the two. Prior to 1987, a trumpet interchange connected the two freeways just west of their crossover here. Photo taken by Douglas Kerr (09/00). One mile ahead of Exit 39 with the access road linking the New York Thruway with New York 690 north and Interstate 690 east at Seneca Knolls. New York 690 north provides part of a route linking west Syracuse with Fulton and Oswego on Lake Ontario. Photo taken 05/09/05. Traffic to Interstate 690 east and New York 690 north departs Interstate 90 east at Exit 39. I-690 angles southeast along Onondaga Lake to the New York State Fairgrounds and the village of Solvay en route to Downtown Syracuse. Photo taken 05/09/05. Motorists from both directions of the New York Thruway emerge from the toll plaza at Exit 39 and partition into ramps for NY 690 north to Baldwinsville and I-690 east to Syracuse and the western suburbs of Fairmount, Westvale and Camillus via NY 695 and NY 5. Photo taken 05/09/05. “NYS Fair officials: I-690 ramp not perfect but would ease jammed lot.” The Post-Standard (Syracuse, NY), January 23, 2017. New York Routes – Routes 600-699. “I-690 Rebuilt to Safety Standards.” Syracuse Herald American (NY), January 25, 1987. “Assembly okays bill allowing toll-free commuting on Thruway in Syracuse area.” CNYCentral, June 21, 2017. “Gov. Cuomo vetoes bill that would make Thruway free for Syracuse commuters.” The Post-Standard (Syracuse, NY), October 24, 2017. Page updated January 28, 2019.